Faith experiences the world through her heart and inspires all those around her to do the same. 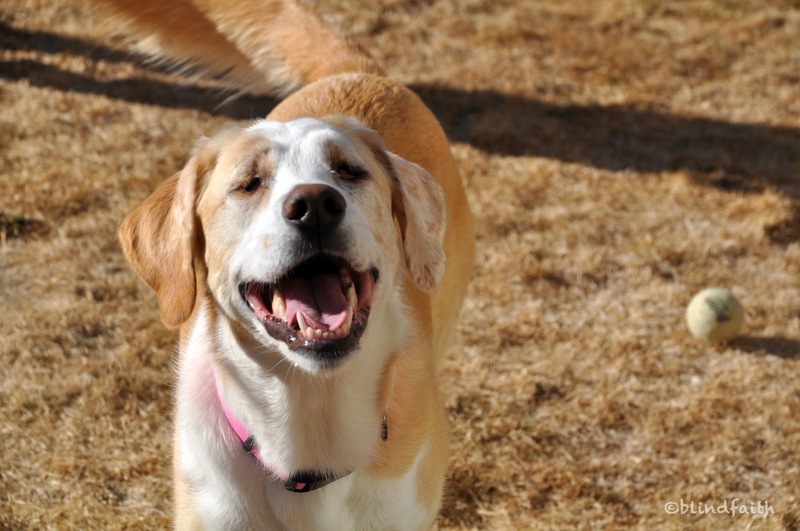 She is an energetic and loving, adopted four-year-old Golden Retriever, Yellow Lab, Australian Shepherd mix. She is also blind in both eyes and is in training to become a certified therapy dog. Both Kim and Dean had previous experience with blind dog. Kim had a dog that was blind in one eye and Dean had a dog that went blind later in life. Although they fell in love with Faith immediately, they knew that adopting a blind dog, especially one who is young and active, would be more challenging and so they took time to make a thoughtful decision. Before bringing Faith home they relocated breakable items and moved the coffee table out of the living room to create more space. They continue to keep their house clutter free, and if they move furniture, they make sure to show Faith around so she can adjust. On Faith’s first day home, Kim and Dean led her around the house naming things as they went along – living room, kitchen, back door, etc. Just a few hours later, Faith made her way down a long hallway and found her water dish on her own. Like most blind dogs, Kim says Faith has an amazing innate ability to map out her environment, adapt, and problem solve. Kim believes in creating a supportive environment, but also letting Faith be a regular dog. Yes, sometimes she bumps into things, but that’s part of life and the learning process. When Kim and Dean adopted Faith, they had two other dogs, Sara and Angie. Both dogs quickly figured out that Faith was blind. 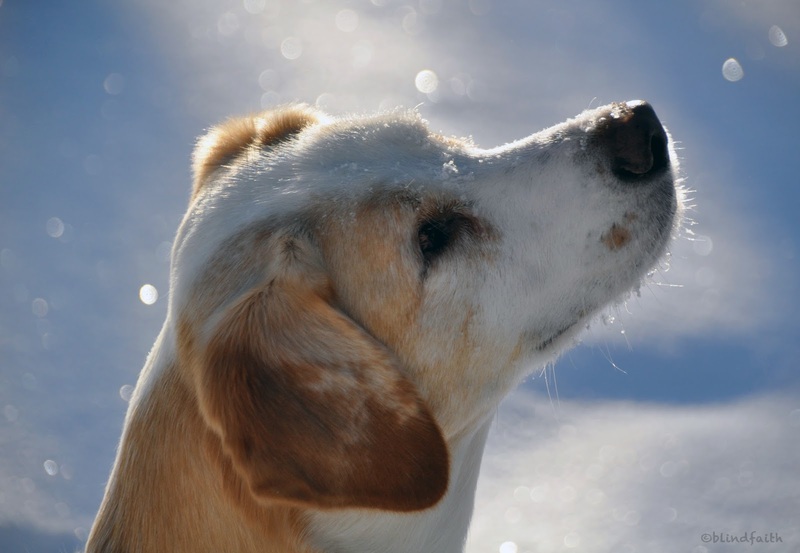 Sara avoided Faith as she didn’t appreciate being plowed into by a fast moving, young dog. While Angie, who was originally rescued from a hoarding situation and has multiple health and emotional scars, took on the role of mother and playmate. Although Faith is very good at taking care of herself, both dogs have stepped in to help on a few occasions. Early on, before Faith had good recall, she charged out the door and into the front yard. Angie followed, grabbed her by the collar and led her back inside. Another time, she snuck out the door and started off down the road. Sara ran ahead of her and body blocked her until Dean caught up and brought both dogs home. Most recently they adopted Lucy, a puppy mill survivor, as a playmate for Faith. The first few weeks were challenging: Faith didn’t understand why her new sister kept sniffing her while Lucy was confused as to why Faith didn’t respond to normal dog body language. The adjustment period was challenging and lasted about a month, but now the two are best friends. They play, hike, wrestle, and engage in all kinds of regular dog activities. Angie is also perfectly content to take on the secondary playmate role to both younger dogs. Faith has participated in several obedience classes and has earned her Canine Good Citizen title from AKC. Kim stresses the importance of using commands like right, left, step up, step down, careful, stop, and come consistently. When going for walks or hikes, Kim and Dean are Faith’s eyes and so maintaining trust and communication is vital. Kim believes Faith is a natural healer and actively seeks out people in need of care and comfort. She nuzzles their hand, and if she gets a positive response, leans on them and gently places her head in their lap or raises it for kisses. Faith loves children and Kim hopes to eventually work with kids battling disease or disability. They also continue to volunteer as a team with Faith’s rescue organization Retrieve a Golden Of Minnesota. Kim says Faith is one of the happiest, sweetest spirits she has ever met. Faith never lets anything get her down, and when she hits a bump in the road she learns from it, shakes it off, and moves on. She inspires everyone she meets to find and live their joy. Thanks to Faith, Kim left behind a corporate job she no longer enjoyed, and followed her dream of opening her own business. Blind Faith Canine Massage & Wellness offers a variety of treatments to promote health and healing in dogs of any breed, age, or athleticism. Faith clearly has much to give and teach the world and we wish her well as she continues to share her light and love with all those she meets. Faith is part of The Specials, an award-winning blog series focusing on special needs pet adoption. Senior pets, those with chronic medical issues, behavioral or temperament concerns as well as overlooked or misunderstood breeds like Pits and black cats. If not for the courage and compassion of their adopters, many of these animals might have been euthanized in shelters or died alone and hungry on the streets. You can read more special needs adoption posts here. what a wonderful story… and I bet Faith got her name for a reason… paws up for our blind friends who need our support and a home. Wow, that is one great story and yay for Kim and Dean. It is so great that they took Faith and were so good to her. Sure looks like Faith has one super home. 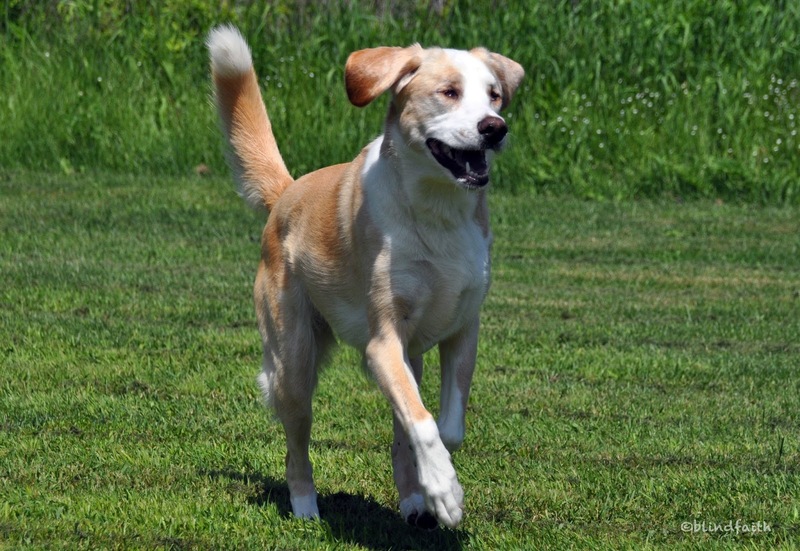 Oh, Faith is a beautiful dog inside and out….you can SEE it! I am so glad she has a loving and understanding home. What a wonderful story. 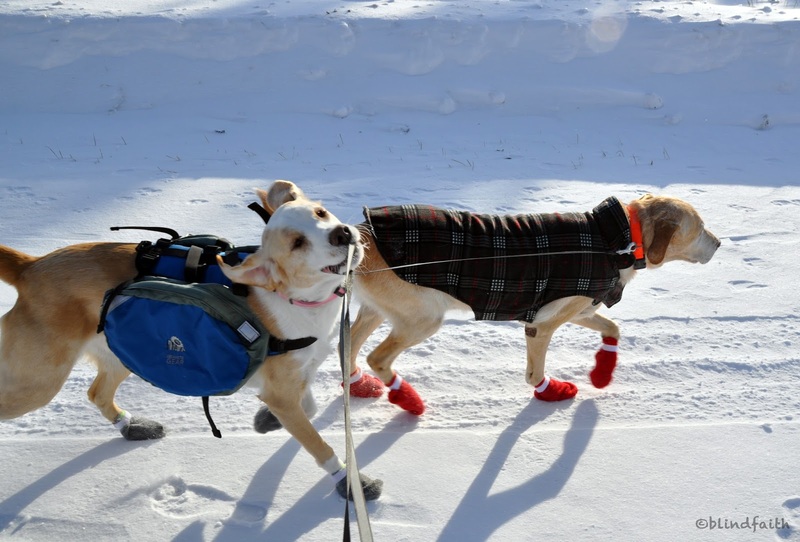 It goes to show that a dog with a disability can surely adapt and live a normal life! love it. What an exceptional story and post. Thanks for introducing us to this great dog. My husband and I had dogs prior to our cat family. One became blind and deaf as she aged and the other deaf. It was challenging for both of them and us, so I have great compassion and admiration for those who take on the tasks of training these dogs. I always love to hear how their dog companions help to watch out for them. Faith is going to make a great therapy dog. Wow, thank you Kristin for your entire series of specials. Your writing is so beautiful and the story of Faith is inspirational! Kim and Dean are "special" Dog parents. I love that they 1. Rescued Faith 2. Helped her become a Therapy Dog. There is no better way to show someone who is ill or with a special need that they are not alone and can overcome than introducing them to Faith. 3. Kim has taken her love and lessons from Faith and turned it into a full time business she loves. I'm looking forward to continuing to follow the Specials and Faith and Kim's story! What a beautiful story! There are some amazing people in this world (one being this blog author) 😉 God bless!! I love this story. Fantastic message there also. Thanks so much for sharing…. What an inspiring story and wonderful post. Close to my heart as my Samoyed, Samson, went blind when he was two years old. He suffers from a disease that affect skin and eyes. Only the quick thinking of our vet who put him on steroids saved Samson's eyesight. Now he gets eyedrops every day and I make sure to have prednisone on hand in case something happens again. I love the dogs in this post. What a wonderful story! Differently-abled pets have so much to offer,and it sounds like Faith is going prove that to everyone! What a lovely story! I love that she became a therapy dog too! Amazing the ability of a blind animal. There's no stopping them. Thanks for sharing Faith's story with us. Wow, this is an amazing story! Kudos to Kim and Dean for adopting a blind dog. I love how the other dogs have taken her under their wing and shown her the way when needed. It's just unbelievable how smart and sensitive dogs (and animals in general) are! I love, love, love this. My friend took in a 16 year old blind dog. He lived two more years…happily! Absolutely fascinating and inspiring. The reaction of the other dogs to Faith shows clearly that attributes like empathy and altruism are not the unique preserve of humans. Thanks for this wonderful post.Cheers,Gail. I definitely wouldn't mind adopting a blind pet. Beautiful story. I just love this story. Faith is such an inspiration, as are Kim and Dean. I used to care for a blind dog when her humans were away on trips, and I always admired her spirit and love of life. Faith sounds so much like this as well, and it's obvious she could teach us all a few things. Thank you for sharing this beautiful story! Yeah for Faith! You are an inspiration!